These kits include all grains, hops, and yeast needed to brew the recipe according to the instructions found in CAMRA’s Essential Home Brewing book. Anspach & Hobday was founded by Paul Anspach and Jack Hobday in 2014 in a railway arch in Bermondsey, London. The brewery was launched off the back of The Porter, their flagship beer and a great example of London’s classic beer style. A&H brew a huge number of different styles, from stouts and saisons, to IPAs and barrel-aged sours. In the early days, their tiny 100 litre kit was barely capable of producing enough to satisfy the demand of visitors to their Bermondsey tap room but several subsequent expansions has seen their capacity grow. Cream ales were developed in pre-prohibition America and Canada by as a response to the bottom-fermented lager beers that were gaining in popularity. The use of corn as an adjunct keeps the style extremely light and crisp. 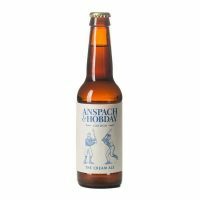 Anspach & Hobday’s Cream Ale departs from the style guidelines in the use of Sorachi Ace. Originally developed in Japan, this hop lends a unique blend of lemon, dill and herbal aromas, and even get hits of coconut, giving The Cream Ale a unique hop profile with a soft, bright fruitiness. Every effort is made to match the brewery recipe precisely, but at times it maybe necessary to change some of the listed ingredients on the recipe to alternatives due to seasonality or availability, but in all cases we do our best replace with something that won’t impact on the overall taste and flavour of the beer.